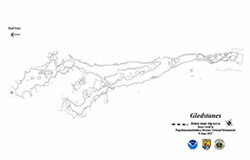 Site plan of Gledstanes shipwreck completed in 2008. At 11:30 pm on 9 June 1837, the British whaler Gledstanes struck the northern end of the reef on Kure Atoll (Casserley 1998: 60). The Captain and crew launched three ships' boats and made landfall on Ocean Island (now known as Green Island). The following day, crew returned to the vessel and, after cutting away the masts, were able to salvage some provisions. The next day the wreck broke apart in the heavy surf (Pacific Commercial Advertiser January 29, 1838). 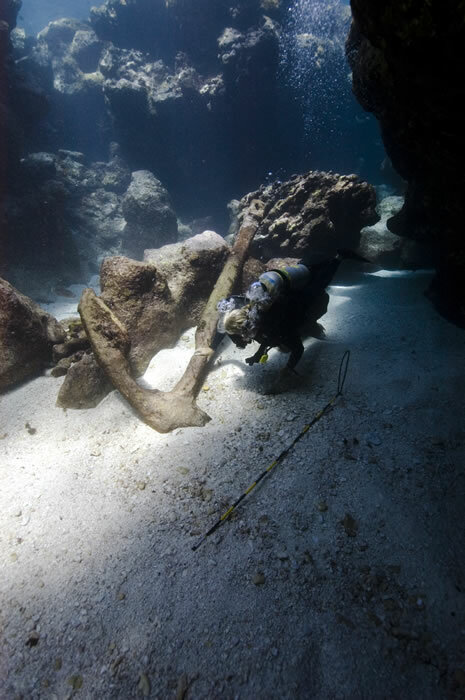 The crew established a makeshift camp on the island and passed their time picking up pieces of the wreckage that had been washed over the reef and into the lagoon with the intention of constructing a vessel from the salvage. 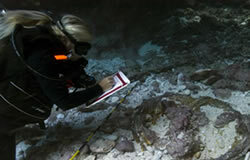 Kelly Gleason investigates a try pot at the whaling vessel Gledstanes at Kure Atoll. Credit: NOAA/Casserley. The keel of a 38-foot vessel was laid two weeks after the loss of Gledstanes. The axes and adzes necessary for building the craft were manufactured from whale spades and augers and chisels from lances. The bellows for the blacksmith was composed principally of the compass belonging to the ship and the boat was caulked using a sort of channum [sic] made from lime and seal oil (Sandwich Island Gazette November 11, 1837). After approximately three months the vessel was completed and named Deliverance. Captain Brown and nine others set sail for the Sandwich Islands while the rest of the crew remained on the island (Pacific Commercial Advertiser January 29, 1838). While en route Deliverance encountered the American ship Timoleon, who generously supplied them with much needed provisions (Sandwich Island Gazette November 11, 1837). Deliverance arrived at Honolulu sometime in November, 1837, while the remaining crew on the island were rescued several months later by H.B.M. Consul in Honolulu (Woodward 1972: 4; Casserley 1998: 60). 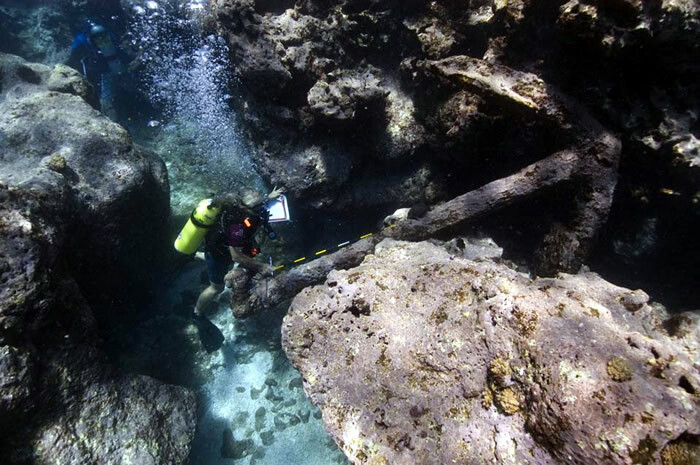 Kelly Gleason documents an anchor in the reef at the Gledstanes shipwreck at Kure Atoll. 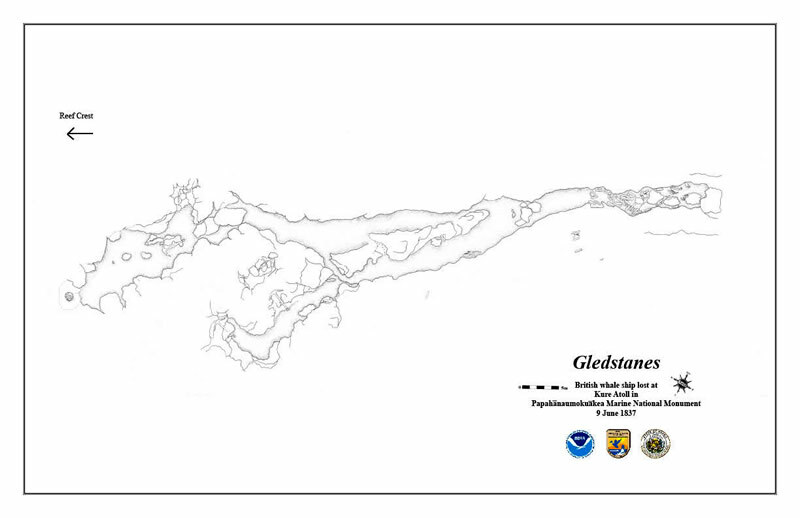 The shipwreck site believed to be the Gledstanes was discovered in 2008 during exploratory dives in the area where the ship was reported lost. The site consists of mainly large heavy artifacts scattered over a 70 meter section of the reef at depths ranging from two to seven meters. Some of the artifacts are extremely eroded, suggesting that they are affected by scouring due to wave and current activities. 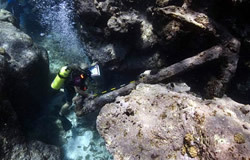 The distribution of the site suggests that the vessel hit the fringing reef and broke up, leaving artifacts resting on the reef top and in deep-spur-and groove channels. 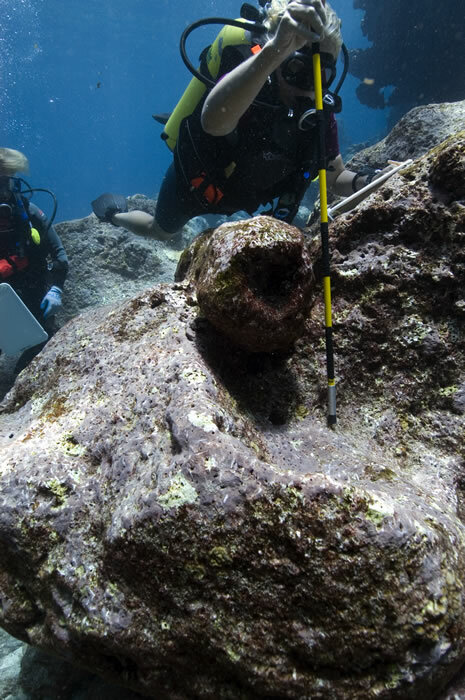 Artifacts include four large anchors, one small cannon, and another possible cannon, a pile of anchor chain, approximately 50 pig iron ballast bars, and copper fasteners of various sizes. The lower portion of a try pot with tryworks bricks inside of it and possible iron tryworks knees helped to identify the remains as those of a whaler. All of these remains are thought to be those of the British whale ship Gledstanes. Historical accounts of the loss of Gledstanes, two different maps providing the approximate location of its wrecking, artifact characteristics and the fact that the only other whaler known to have been lost at Kure all support this identification. 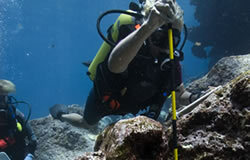 In 2008, the team documented features and artifacts on the seafloor and completed a site plan. The team also collected photographs and high definition video footage of the site. Interpretation of the Gledstanes shipwreck site is ongoing. Casserley, Tane. "A Maritime History of the Northwestern Hawaiian Islands from Laysan to Kure," submitted to Marine Option Program, University of Hawaiʻi 1998. 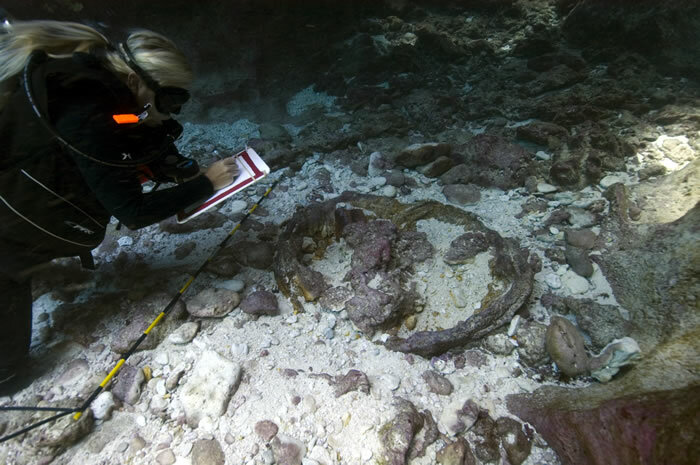 Kelly Gleason documents an anchor in the reef at the Gledstanes shipwreck at Kure Atoll. Credit: NOAA/Casserley. 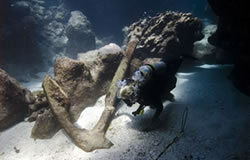 Kelly Gleason investigates an anchor at the British whaling ship Gledstanes at Kure Atoll.